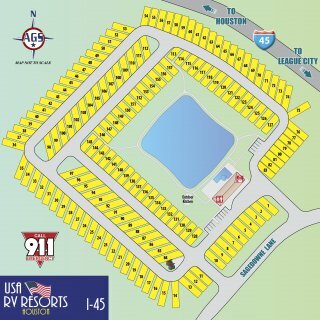 Ask fellow campers about "Marina Bay RV Resort" and nearby attractions. Nice but close together level cement sites. Overall very nice resort. Clean & bright. Mix of short & long term. Close to Kemah boardwalk, shops, & restaurants. Galveston & Houston lots to offer. Three small pools and water views with fire pit in common areas. We camped at Marina Bay RV Resort in a Fifth Wheel. Tookies for burgers was great and very reasonable price, Shipley Do-Nuts delicious and the Kolache Bakery in League City was very good. A quirky, but good place for lunch is the Hoagie Ranch almost across the street from campground. Don't miss out going to the Kemah Boardwalk and getting homemade ice cream at Cool Cow Creamery, you'll make multiple trips! Houston and Galveston have a lot to offer and are in close proximity. This is my go to CG while spending weeks visiting my daughter in nearby League City. This is a very good CG for sure. 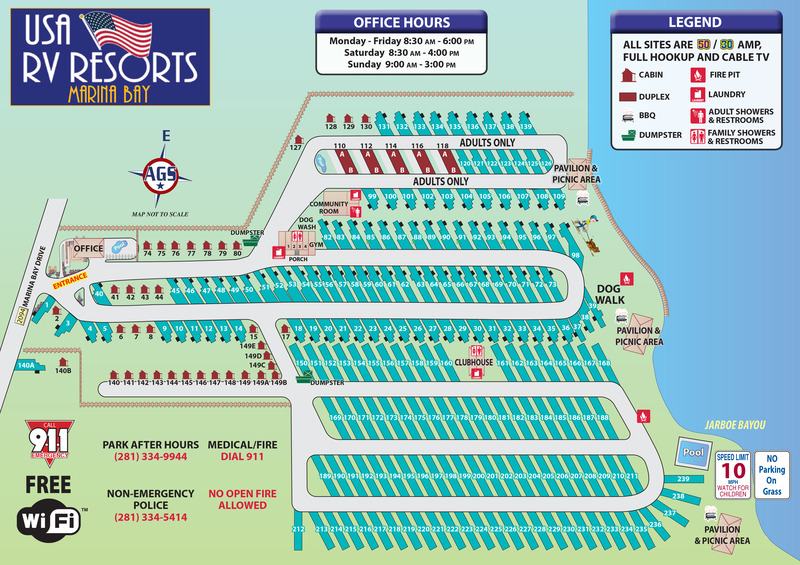 All facilities and the grounds are clean and well kept. The office staff are awesome. You are close to many alternatives for food/drink/entertainment. I generally stay here for 2-4 weeks a year. Although some might suggest the rates are high...this CG is worth the price for me. We camped at Marina Bay RV Resort in a Motorhome. We wanted to visit Houston but also wanted to stay away from the big city. 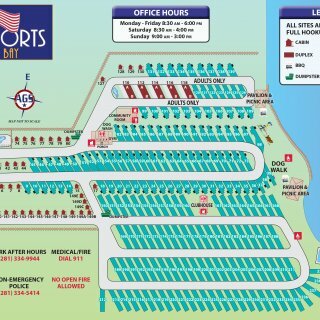 After researching parks in the area, we decided on Marina Bay since they said they were able to accommodate us traveling in a 45ft motorhome towing a 25ft trailer. It was not quite as easy to get into our 70ft site, the longest they have and we used every inch of it. Concrete roads, level concrete pads and full hook-ups. This park has 3 swimming pools and frontage on a bayou. Dog friendly. It seems most people who stay here are living in the park on a semi-permanent basis. Probably, construction workers or people displayed by the hurricane. Everyone is very friendly. The park is well maintained and clean. It took roundabout 25-30 minutes to get into Houston. We camped at Marina Bay RV Resort in a Motorhome. We visited the Houston City Aquarium and enjoyed it. All flavors of shopping are very close-by. We visited the NASA Space Center, about 15 minutes away. Mixed review here. Pros: Clean, level, well run, good price, Green space next bayou, close to boardwalk Cons: Extremely small spots, I could not extend my awning fully or it would hit neighbors RV, table on our site , looks like maybe 60% of sites have them, and those are two person tables. No fire rings(community gas fire pit) Conclusion: nice RV "Parking" like a hotel. but not for folks who want any semblance of an old fashioned camping experience. We camped at Marina Bay RV Resort in a Motorhome. Our Hurricane Harvey Price Gouging Story My family of three relocated from San Antonio to Houston this summer when I separated from the Air Force after 12 years of active-duty service. My wife grew up in the Houston bay area, and we were both excited to start new careers and raise our 1 year-old daughter near her extended family. My wife is a high school teacher and I'm a member of the Texas Air National Guard. Since our new-construction home would not be completed before the start of the school year, we were happy to find a furnished, 2-bedroom cabin at Marina Bay RV Resort (925 Marina Bay Dr., Kemah, TX 77565; http://www.marinabayrvresort.com) and planned on living there until our new home was completed. Then Hurricane Harvey hit. We packed our suitcases and evacuated the coast on Friday, August 25th. Over the next few days, we watched the natural disaster unfold on the Weather Channel and through our hotel window in The Woodlands, TX. I called Marina Bay on Wednesday, August 30th to find out if the property had sustained damage and if the surrounding roads had re-opened. The property was damage-free, the manager told me, but its pricing structure had changed. Instead of the $1445 monthly rate that we had been paying, the cabin would now cost $165 per night. So, effective immediately, the average nightly rate more-than-tripled from $51.61/night ($1445 every 28 days) to $165/night ($4950/month). No advance notice. No grace period. No exceptions. And at $4950/month, we were priced-out of the cabin that we had occupied since early July. The price hike was legal, the Marina Bay manager explained, as rental property is not subject to the Consumer Take your money elsewhere. When other business owners were showing compassion and generosity after one of the largest flooding events in America, Marina Bay ownership saw a business opportunity and moved quickly to boost profits without any regard for the families its increased rents would displace. Act. We camped at Marina Bay RV Resort in a Cabin. Nice place to stay in. Staff is friendly and resort is clean. Pool is awesome. We camped at Marina Bay RV Resort in a Fifth Wheel. Alright going straight into it, this is no resort. It is very clean. Restrooms and other facilities are the way you want them, like being in a hotel. That's where the "Resort" ends. Sites are really close together. We could not open our awning all the way, it WOULD have hit the RV next to us. If you're not staying in the park during the days none of this will matter. We spend most of our time in Houston, NASA, and other specialty shops in the area. Each site has immaculately trimmed St Augustine Grass between them. Some sites have tables some do no, ours didn't. Staff were pleasant and drove us to our site. Park has three pools and a fishing/observation pier. Overall it's a very nice park. We camped at Marina Bay RV Resort in a Motorhome. Read the fine print, READ IT! NO refunds, at all. So plan accordingly. Don't get mad if you have to cancel. Up front you are told no refunds. There are quite a few restaurants with in walking distance. An attractive urban park catering to long term (aka working) adults. Premium prices for short term travelers like us. But it was close to friends we were visiting. It is also close to Houston and NASA with many local shopping and restaurant choices. The Jarboe Bayou provides a pleasant environment to a well maintained park. Staff is friendly and very helpful. The wifi isn't strong enough to provide service to all who want to use it. Showers and restrooms were very nice. Paved roads and sites are a plus. We enjoyed our stay here. We camped at Marina Bay RV Resort in a Motorhome. We were in a pull through site and there wasn't much space between us and the RV's on either side. The place is very clean. Kind of mystified as to the need for number coded locks on all the bathroom doors, laundry and workout room. I guess non guests drive in uninvited to workout, do laundry and shower up for the day?? The length of the site was just adequate for both the RV and tow vehicle. Some were parking in the road which made it difficult to maneuver when leaving. We camped at Marina Bay RV Resort in a Fifth Wheel. We are near the middle of a one month stay and I have nothing but good things to say about this park. We are staying in the adult only side of the park in a premium site, very happy with the choice. As mentioned in other reviews, there are some more permanent residents who work in the area and leave for work early. We have not found this to be a bother and everyone seems to be sensitive to others staying in the park and leave quietly. The park is extremely well maintained with staff constantly cruising the park to ensure it is clean and any problems are addressed. Pools are kept clean as well, and having the choice of three different pools is superb. One of the best things about this park is its proximity to shopping, restaurants and activities for young and old. The Kemah Boardwalk is an easy walk away, as is Target, Home Depot, Walmart and ALDI. By staying for a month the rate worked out to roughly $24 / night. Electrical is extra on a one month stay. Seems to be good value to me. We stayed in a 37' motorhome in a back-in site and there is enough room for our towed vehicle directly out front of our unit. Sites are level, if anything they have a slight slant towards the water at the end of the park. Nothing levelers can't handle. We will definitely come and stay here again. We camped at Marina Bay RV Resort in a Motorhome. Long term rental in the Premium "on water" spot and the average nightly rate is $32. Landscaping EXCELLENT, Bathrooms EXCELLENT, 3 pools - 2 are very nice and other one is up front by arrivals. Dog bathing area. Laundry room EXCELLENT. Work out room is GREAT. Fire pit is GREAT for cooler evenings. Great little tiki tables all around. I do agree with one of the other reviews, that at least one pool could be heated. The water location they have is simply lovely, and the sunsets and sunrises are lovely. We camped at Marina Bay RV Resort in a Fifth Wheel. There are many different restaurants around that you can easily walk to. Skippers for Breakfast and Lunch, Opus for Dinner, Jackies & Aspens (smoking places) for after dinner with live music. There are many other shops and fun places around. This park is very central. We take our bikes to Clear Lake Shores and enjoy a peaceful bike ride on the little island surrounded by water... with ducks, boats, etc. We take our kayaks out on the water and visit different locations also. You are also able to take bikes all the way into the Kemah Boardwalk area without getting on major roads. You could have several opinions of your stay here, depending just on the space you occupy. We stayed 2 months in several Premium sites, and if you "add back in" the cost including metered electric, the cost was 31 bucks a night, vesus the $75 nightly rate (Elect included) for a Premium space. The greater majority of the "Park" is occupied by hard-working oil service employees...and their families. If you sleep "light", you'll hear the truck engines start up at 5am. The less-expensive pull-thru sites are sandwiched pretty close together. If you are travelling for fun... the Premium Sites offer some more space, a cool thatched roof patio set, and their placement really showcases the beauty this Park offers. Near the Bayou there is a pretty water feature (I don't call 55 degree water a "pool"), excellent dog walk area...and a boardwalk/fishing pier. The fishing part is more for entertainment...lots of shallow water, mud...and snags. The exercise room is over-heated, but well equipped. The ice machine was a nice touch, as were the clean restrooms. The best part? Employees keep the place looking nice, and rigorously enforce the many pages of rules designed to maintain a "non mobile home park" look, and feel. By far, some of the best On-Site Management we have ever encountered in our travels. I'm afraid I'm not as happy with the off-site Corporate Ownership. Really, you're grossing (by my estimation) 175 Grand per month in total Park rent...and you can't turn on the heater to at least one pool? That's just being greedy. If there was a heated pool, we would have rated Marina Bay a high 9...IF we stay again in a Premium space. We stayed here in a 43' Coach. A GREAT place to ride your bike, and bring your camera for some great sunset images. When coming in Eastbound on Hwy 2094, the light at Clear Lake Road (really makes getting out of the park easy) demands a WIDE right hand turn, especially if you have a large rig with a tow car. Stay left to check-in. We camped at Marina Bay RV Resort in a Motorhome. The Boardwalk is a mile away, be sure to visit T-Bone Tom's. Heated pool, not so much. Ice cold. Quiet time from 10 pm to 7 am, no sir. Long timers all leave really early for work and the slamming of truck doors and loud mufflers begin at 5am all the way til 7am. Also black lab from neighboring business barks all night on and off and all day long when he sees other dogs being walked. Also they charge you $3 per mail package delivered. Never have we come across this as full timers. This place is way overpriced. Not impressed and will not be stopping here ever again. We camped at Marina Bay RV Resort in a Fifth Wheel. We stayed here for the first time during Mardi Gras time and had a blast. The park was clean, well lit, staff was friendly and very accommodating (gave us great restaurant recs) and it is very centrally located to all the fun in the area. Our dogs lo-o-oved the grassy area, and we really enjoyed the dock right on the water. We were a little wary after reading the previous review, but they definitely have fixed all the things that were complained about. If you are traveling to the Kemah area, this is the nicest place no doubt. My husband and I will definitely be back! We camped at Marina Bay RV Resort in a Motorhome. For some great seafood, eat at Joe-Lees! You can walk from the park. I was really looking forward to coming back to this park but it has really changed. Owner seems to have become money hungry and making poor decisions. Park is very dark because lights are all out and has supposedly been like that for months. He has the older ladies in the office doing night time security, which is dangerous! My husband watched an incident happen with a drunk guest and was worried for the poor woman's safety. Apparently not screening people anymore. Police were there twice during our 4 day stay.Internet not working, problems with cable TV and electric service. All I heard the whole time we were there, was how upset everyone was. Very sad. I felt bad for the office staff who get to hear all the complaints.Used to be a really nice place. Luckily, there are a lot of new places popping up in the surrounding area that we can try. We camped at Marina Bay RV Resort in a Fifth Wheel. There are many different restaurants around that you can easily walk to. Skippers for Breakfast and Lunch, Opus for Dinner, Jackies & Aspens (smoking places) for after dinner with live music. There are many other shops and fun places around. This park is very central. We take our bikes to Clear Lake Shores and enjoy a peaceful bike ride on the little island surrounded by water... with ducks, boats, etc. We take our kayaks out on the water and visit different locations also. You are also able to take bikes all the way into the Kemah Boardwalk area without getting on major roads. 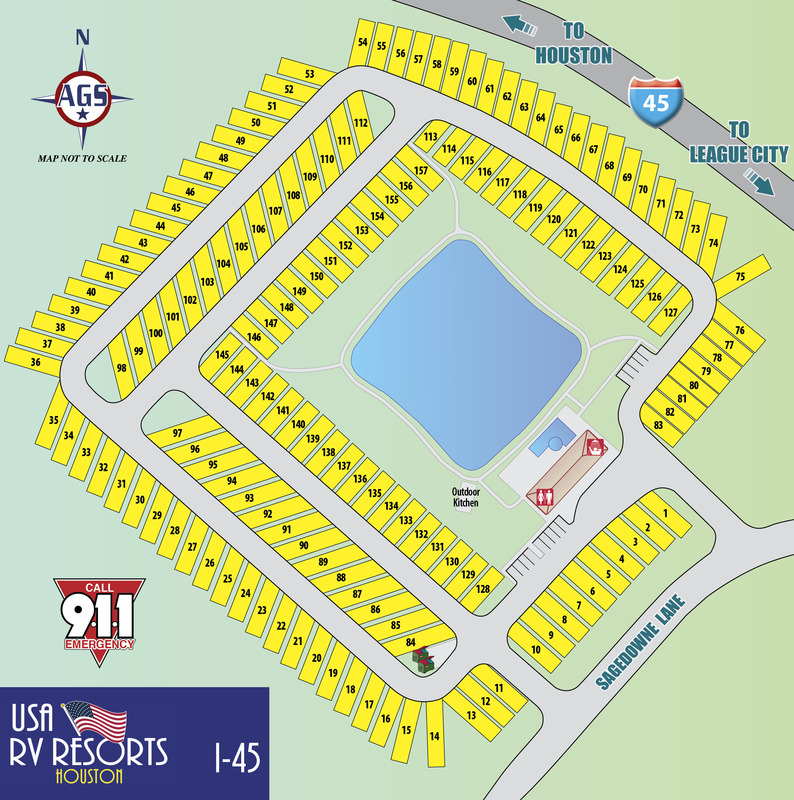 Are you affiliated with Marina Bay RV Resort ?